Hydroponic systems are great for growing indoors, especially cannabis. It gives you all the tools to control the process and have them grow faster and better. One of the tools you will need for your grow tent is a hydroponic humidity controller. Humidity for hydroponics is of great importance as too little or too much can have an adverse effect. You definitely need these controllers regardless of the fact whether the climate you live in is humid or not. You never know how low humidity can be, especially indoors where hydroponic systems are usually found. Keeping a humidity controller within the system will ensure that your plants get the kind of environment they need in order to grow to their full potential. The best hydroponic humidity controllers will ensure that the humidity levels are as per the requirements of the plants. They basically monitor the levels and humidify or dehumidify, whatever the need be. Best Hydroponic Humidity Controllers- Top 5 for 2019. This one can rightly be regarded as the top hydroponic humidity controller as it works with any system and produces the best results. It is compatible with equipment that is operating on max 120 Volts. All you have to do is set the desired humidity level, and the rest is its job. It is one of those appliances that you just have to buy once and then perhaps use the rest of your life. It is a favorite among gardeners, farmers, especially those who grow weed. The humidity level can be set up with the knob on the controller. Weighs just 2.7 pounds so easy to transport as well. C.A.P (Custom Automated products) made sure that you do not have to replace your humidity controller anytime soon by using only the best materials and technology. If you are looking for something a bit more all-rounder then CACGC1 is the perfect fit for you. This one is a complete greenhouse controller, i.e. it regulates humidity, temperature, pump cycle, and CO2 cycle. Not only that, but it can also control the lights in the greenhouse with a 24-hour clock. It is a modern tool designed for bringing the entire control of the hydroponic system in your hand. It helps to optimize all the aspects so that your plants can grow fast. That qualifies it as a contender for the top hydroponic humidity controller. Considering you are getting multiple controllers in one, this one is good value for money. The HID lights are controlled 24/7 and there are two outlets for that. Light, as you know, is equally important as moisture or pH. When lights are off at night, an auxiliary nightlight is turned on. It weighs just a little over 5 pounds and is quite easy to use with the most knobs for controls. Since everything is timed, you can sit back and relax as your plants grow at above average rates. With a 20% – 90% range, this controller accurately detects the humidity in the room and adjusts it to your required levels. There is a switch for humidification or dehumidification which you can set up depending on the weather for the day. This one features ventilation louvers that protect from water accumulation. You can be sure that this product will last longer and help you grow many batches. It requires 120 Volts tops and can work in virtually any setting. It is made of durable powder-coated steel that makes it ideal for use in any kind of climate. It comes with a grounded piggyback cord that makes it easy to work with. It is built in 4 percent split differential. If you live in an already humid climate, this is the product you need. Inkbird Controller is a dual-purpose as you can control both temperature and the hydroponic humidity level. With calibration functions, you can calibrate the temperature and humidity. It works with a simple on and off switch. It features an alarm system that notifies you if the levels are below or above the range you have set. The sensors in these controllers are waterproof and work highly accurately. If you are looking an affordable but functioning controller, this is it. The probe wire length of 6 feet is quite generous and makes it more flexible. One of the best hydroponic humidity controllers is the Saturn 4 which is highly useful for controlling temperature and humidity. It basically works to keep the whole environment better for the kind of plants you are growing. It also features a CO2 controller and a night only device, making it a complete solution for your hydroponic system. It is equipped with a 15-foot remote sensor and photocell for the night. Since it is digital, you can trust it to be accurate. The device is covered in by a plastic enclosure to keep it safe from dust and moisture. It is expensive, but you can think of it as an investment in your garden. This is a good buy as you are not just getting a humidifier, you also get CO2 controllers and night control so that your plants have optimized conditions round the clock. The best part is that it comes with a three-year warranty. This is an ample period to see how effective this device really is for the plants. Based on positive hydroponic humidity controllers reviews, these are the top five products that have helped many growers. Every plant requires a certain level of humidity and if that is not consistently maintained, the growth rate can slow down. If you opt for the best hydroponic humidity controllers, you ensure that regardless of what the climate or conditions are in your indoor garden, the plants have the required humidity. It comes down to your budget in the end as to which one you can afford. Any of the above controllers can easily last a lifetime if used properly. When growing weed indoors, simply relying on the fact that climate change is happening and the current CO2 levels would be enough for your plants to flourish, is not enough. Sure, you can use mushroom boxes or fermentation, but what can really make a difference is if you use the best CO2 regulators for marijuana. It is believed that there is 400 PPM of CO2 in the environment these days, thanks in part to climate change. However, if you ramp it up to upwards of 1000 PPM, your weed can grow fast. If you utilize the best weed CO2 regulators, you can end up with 30 percent more yield. CO2 levels of the environment are crucial for a good grow, and indoors, the levels can be even lesser as compared with outdoors. So here we have the best cannabis CO2 regulators for you to choose for your grow tent. This is one of the best CO2 regulators for marijuana as it is made from sturdy brass. It is not vulnerable to moisture or humidity and will work seamlessly for years to come. It has a solenoid valve flow meter and a high-pressure gauge for 0-4000 psi. You also get a 5-meter plastic dispensing tube with this regulator. It keeps the CO2 levels that are ideal for weed and potentially can yield up to 40 percent more. It fits all standard CO2 tanks and can work with any kind or size of the grow tent. The maximum level you should keep is 2500 PPM as anything above that can be harmful too. The manufacturer of this product specializes in hydroponic system products so if you are growing the weed in a hydroponic system, this is the best CO2regulator for hydroponic you should have in your grow area. This product is made from industrial grade materials and is designed to work with any grow room or greenhouse. It comes with 10 foot long ¼ inch air pipe and a generously long 6-foot power cable. It can be used within a system that runs on 120 Volts. The flow gauge is capable of producing 0.5 to 15 SCFH of CO2 every hour which is optimal for weed. It can easily be connected with a 20# or 50# Carbon dioxide Tank. It works with the majority of the valves regardless of the condition they are in. It is designed to last long with only quality materials used in the construction. You will need a CO2 meter to be used with this for accurate readings of CO2 levels. The Titan controls is compatible with all 120 Volts controllers and timers. Titan Controls is known for their high-quality products for indoor gardens and if you already have their humidity or light controllers, you can get this one for maintaining required CO2 levels. It features a strong solenoid valve and oil-less pressure gauge. The CO2 dispensing line is quite long measuring 12 feet. It also comes with two plastic tank washers which makes it all the better in terms of value for money. If simplicity cuts it for you then this is the best marijuana CO2 regulator. It is easy to install, easy to use and works well with other controllers. If you are looking for something more multipurpose, then this digital environment controller from Titan Controls should be your choice. It is a completely digital system that controls both humidity and CO2 levels of your grow tent leaving it with optimal conditions for the weed to grow faster and yield more. The photocell on this one allows you to set up the system for day or night. What makes this particular model one of the best cannabis CO2 regulators is that it has a very basic interface. Someone who does not have a lot of growing experience can easily work with it. Since it is a digital system that does two jobs (humidity and CO2 regulation), it is a bit expensive. However, it bears the name of Titan Control which has gained a steady repute in the weed growing circles. It has an enclosure that protects it from moisture and dust, keeping it functional for a long time. Advanced CO2 generator that is best for you if you have a large grow area and growing marijuana is more than just a hobby. It features a two-stage safety pilot that only allows the fuel to the burner once the pilot is lit. The solid state electronic ignition module lights the burner itself. This device is available for both propane and natural gas. It is an expensive model but its running costs are very low. The fuel supply automatically stops if the unit falls which makes it very safe. Everything from the burners to the enclosures is made from high-quality materials and protected with powder coating. It has four burners that produce ample CO2 for a large growing area. This thing weighs over 22 pounds, which is a lot more than what the conventional CO2 regulators weigh. Even though it is a big device, it is relatively easy to use. Last Thoughts about the Best Cannabis Co2 Regulators. The above five products are the best weed CO2 regulators on the market today. CO2 is extremely important for any kind of indoor plants. In order to allow them to grow to their full potential, you have to provide optimal conditions for that particular plant. Weed can really flourish if provided with CO2 levels of 1500 PPM. That may not be possible to achieve without the help of a regulator. Most of the best cannabis CO2 regulators are quite affordable and will last for years. Nevertheless, if you have the budget for it, invest in the best one regardless of the price. The amount of money you will save by growing your own weed should pay back for the regulator or any other device you may have purchased soon enough. One of the things people forget when growing their own plants is to check for the pH level of the soil. There are virtually hundreds of kinds of vegetables and plants that require a specific pH to grow properly. People spend a lot of money on fertilizers when all they really need is the best pH Soil Tester. Fertilizers, in fact, go to waste if the pH level is not as it should be. Anyone embarking on growing something in their backyard or setting up an indoor tent should have a basic knowledge of what pH means. It means the potential of Hydrogen and indicates the number of Hydrogen ions concentration. Using a meter can give you the chance to lime up your crops to bring the soil to the desired pH level. This small tool can tell you the pH of your soil, which ranges on a scale of 0-14. A reading of 7 indicates a neutral level while below 7 is acidic and above 7 is alkaline. You should know what the required level is for the kind of plants you are growing. Here are the best soil pH testers you should consider for your garden. Top 5 Ph Soil Tester Reviews, choose the Right One for your Needs. This is a handy tool as it is not just the best pH soil meter; it is also best for measuring moisture and light of the soil. All three things are absolutely crucial for the timely growth of the plants. 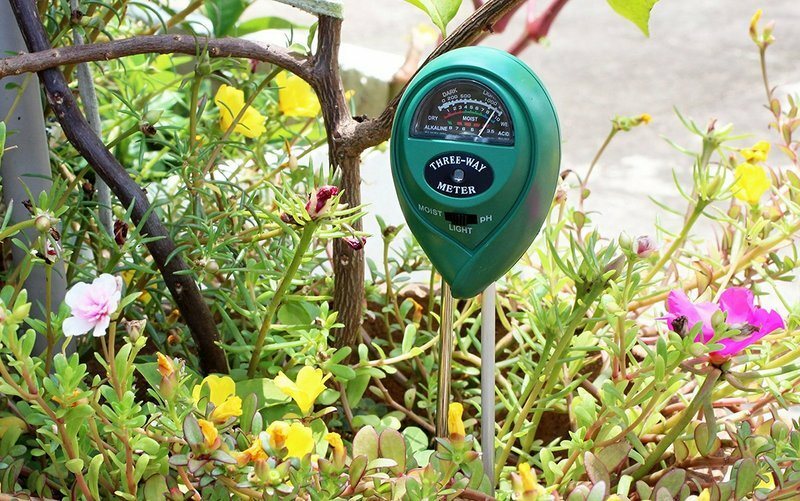 This meter does not require a battery and has two probes that go 4 inches deep into the soil. It can be used for any growing area like a lawn, garden, patio or backyard. It is a simple, cheap, and eco-friendly tool you can carry in your pocket. What makes this one the best pH soil tester is its elaborate meter with clear indications about what the levels mean. This one too provides three measures, including pH, moisture, and light. You can know when to adjust the pH levels or provide more water or sun to your plants. This is especially useful for indoor gardens where light is already insufficient so you have to measure it constantly. Its pH range is 3.5-8, moisture range is 1-10 and light range is 0-2000 lux. This is what you would find on most meters. The probe length is quite long 7.9 inches to be exact which allows it to produce highly accurate results. If you want something small, light, and portable, this is the best pH meter. Kope Soil Tester is yet another best soil tester as it offers dual purpose: you can check the moisture as well as pH levels. The design is very modern and the device probes into the soil itself. It is entirely self-powered and produces accurate results for pH (3-8) and moisture (1-8). The waterproof metal electrode, lightweight, and unique design make it the best soil pH tester as well as moisture tester. PH is an extremely important reading for any farmer as your plant’s life depends on it. It is a little pricey, but the high accuracy makes it worth the money. This product also includes a helpful guide to vegetables, fruits, and shrubs and their corresponding pH and moisture levels for optimized growth. Although you can easily find this information online too, sometimes it is helpful to have a guide right in your hand. The Luster Leaf Digital Soil pH Meter is completely digital and shows legible results on a screen. You can immediately know if the soil is acidic or alkaline. Although it is quite simple to use there are instructions included to make things even easier. You also get a list of plants and their corresponding ideal pH levels. This one runs on batteries which are included in the product. Since its digital, you can rely on the results and go about making any changes required to the soil. It is designed and made in the US, which ensures high-quality and is best pH meter for home gardens. In terms of pricing, it is good value for money; however, it costs more than analogous meters for pH. This device is highly accurate with an accuracy rate of +/-0.2 pH. Not only does it indicate the pH level on a scale of 3-8, it also measures the moisture content of the soil. It is simple and lightweight which makes it best pH soil meter if you want something portable. There is no need to insert batteries as this device comes ready to be plugged into the soil. A simple color coordinated meter reads the pH levels. The red indicates acidity and green indicate alkalinity. The metal electrode is 295 mm long which is ample for any kind of field. With this in your pocket, you can constantly measure the pH level of your plants and give them the best environment to grow in. Classification of Soil pH Ranges Give your Plants what they Need! When growing plants you have to make sure that all the conditions for optimal growth of that particular plants are met. This includes moisture, pH level, humidity, and CO2 levels. The PH of soil depends on the kind of plant you are growing but most plants need a level of 6 or above. Using the best pH soil tester will ensure that you get an accurate reading. Some might even give you an accuracy of 2 decimal points. These tools should be a part of your garden or lawn equipment and do not cost a lot. For under $20, you can get the best pH soil meter that you perhaps will use for years and years. If you do not have tools for other things like humidity or moisture, you might want to invest in something that contains all of these things in one tester.